For the 2018 remaster, see Red Faction Guerrilla Re-Mars-tered. Games for Windows Live removed from Steam version in Steamworks update. DirectX 10 mode enables Sun Shafts and Ambient Occlusion but may cause performance issues and glitches. This problem is fixed in the Steam version due to game using DirectX 11. Can be redeemed on Steam by contacting the support. Updated version using DirectX 11 and bugs fixed. Comes bundled with the Demons Of The Badlands expansion, the Multiplayer Pack DLC, and 2 exclusive multiplayer maps. 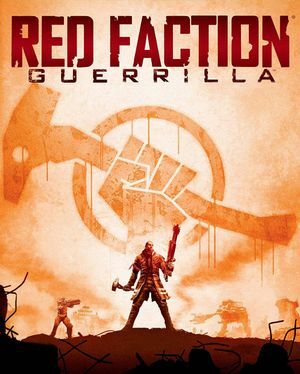 Red Faction: Guerrilla owners on Steam will receive Red Faction Guerrilla Re-Mars-tered for free. Install the latest Patches for the Games for Windows - LIVE version. The Steam version is already patched. Configuration file is in binary format. 15:9 resolutions can be set using launch parameters. For non-Steam versions, see WSGF details. 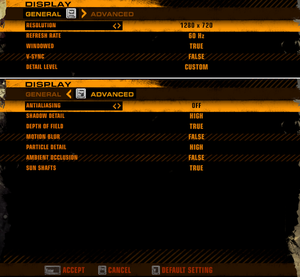 Multi-monitor resolutions can be set using launch parameters. The HUD and menus are significantly stretched. For non-Steam versions, see WSGF details. 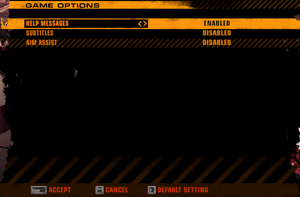 Natively supported in the Steam version, but the HUD and menus are still stretched. 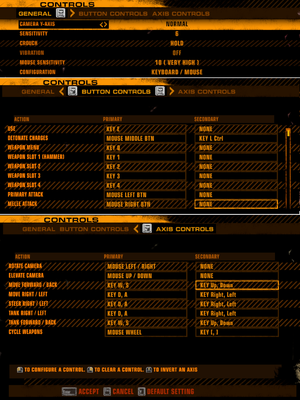 Most of the interface was only prepared for lower resolutions and is scaled up. Adjustable from 45° to 85° in single-player, 45° to 60° in multiplayer (Steam version). For non-Steam versions, see FOV Fix. Disabled by default, can be enabled in the game options. Frame rate is capped at 300 FPS. Same-device restrictions present for axis (movement) controls. E.g., cannot bind Right Mouse button for 'Forwards' and Arrow down for 'Backwards'. No acceleration on foot, but negative acceleration in vehicles and walkers. Can be adjusted using two options, Sensitivity and Mouse Sensitivity, which work independently. Can be set from 1-10. Depend on the input method chosen in the options. 4 Wrecking Crew gamemode only. 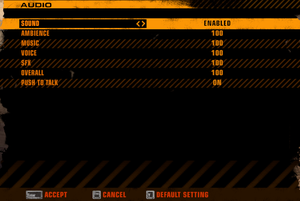 See Helix Mod: Red Faction: Guerrilla. Hex editing skills are required for the operation. Open rfg_display_options.rfgs_pc with a hex editor such as HxD. Look at offset 0x001. There's where width is stored. Height can be found at offset 0x005. Change them accordingly. Refer to this table for common little endian values. Additional information regarding hex editing can be found here. The game might actually perform worse on certain systems. Ambient Occlusion and Sun Shafts will not be available. The menus will only render at around 50 FPS. The game might crash on certain system configurations if you unplug a controller during the game. 9, 10, 11 D3D11 replaced D3D10 in Steamworks update to Steam version. Games for Windows - LIVE, Steamworks GFWL used for non-Steam versions. Makes it easier to install new mods. Comes bundled with many useful mods. Allows you to adjust gravity and make buildings fall down easier. Already included in the Steam version. Copy misc.vpp_pc, effects.vpp_pc and items.vpp_pc. Paste the files into the Reconstructor folder. Copy back all three files to original location (overwriting if asked). Delete, move or rename table.vpp_pc. ↑ 2.0 2.1 File/folder structure within this directory reflects the path(s) listed for Windows and/or Steam game data (use Wine regedit to access Windows registry paths). Games with Steam Cloud support may store data in ~/.steam/steam/userdata/<user-id>/20500/ in addition to or instead of this directory. The app ID (20500) may differ in some cases. Treat backslashes as forward slashes. See the glossary page for details. This page was last edited on 1 April 2019, at 04:43.